Specifically formulated multi-surface cleaner to easily tackle tough kitchen grease and grime. Disinfects by killing 99.99% of viruses and bacteria on hard, non porous surfaces. Leaves behind fresh lemon scent as it cleans. Leaves kitchen surfaces sparkling clean. Mr Muscle knows cleaning should be as easy as possible, which is why it has created a single product for all of your kitchen cleaning needs. 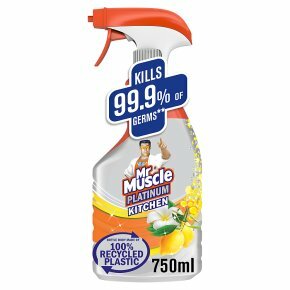 Mr Muscle Platinum Kitchen gives you the power to defeat tough messes on any surface. Dual Nozzle: Open the spray cap to clean horizontal surfaces. Close the spray cap to create foaming action for use on vertical surfaces. Turn nozzle from ?STOP? to ?SPRAY? position. TO CLEAN: Spray 20cm (6-8 inches) from surface until thoroughly covered. For tough jobs, let stand several minutes before wiping. No need to rinse. TO DISINFECT*: Ensure flap is open for spray mode. Spray 20cm (6-8 inches) from surface until thoroughly wet. Let surface stand wet for 5 minutes and wipe. Can be used on all types of kitchen surfaces: worktops, appliances, sinks, range tops, ovens, walls, working surfaces, cabinets, bins and floors. Unplug electrical appliances before using. Spot test all other surfaces in an inconspicuous area. Active Ingredient: Quaternary ammonium compounds, benzyl-C12-16-alkydimethyl, chlorides 0.264% (0.264g/100g). Harmful to aquatic life with long lasting effects. Keep out of reach of children. If medical advice is needed, have product container or label at hand. Wash hands thoroughly after handling. IF IN EYES: Rinse cautiously with water for several minutes. Remove contact lenses, if present and easy to do. Continue rinsing. Do not breath spray. Dispose of contents/container in accordance with local regulations. Use only in well-ventilated areas.